CCM Ultra Tacks Hockey Shoulder Pads - Youth is rated 3.0 out of 5 by 1. The CCM Ultra Tacks Youth Shoulder Pads are an ideal pad with the perfect level of protection as your youth begins their hockey career! 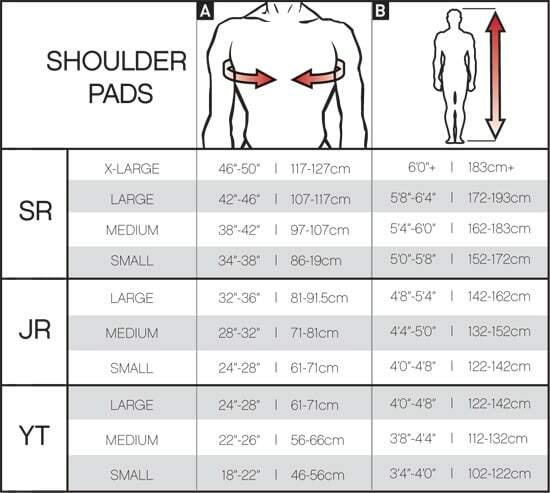 The pads feature a protective, foam body with a one-piece design and an integrated sternum pad. They also feature strong PE shoulder caps to protects against the bumps and falls that come with learning to play the sport. Finally, the Ultra Tacks youth shoulder pads velcro strap closures on the arms and chest to ensure that the shoulder pads stay in place throughout play! Weight: 380 Grams Weight of the product measured in grams (Sr Med, Jr Med, Yth Med). Sternum Plate: Shaped and Molded HD Floating Sternum Protective material covering the sternum. Biceps: Adjustable Bicep w/ Removable Extension Type of design and/or protective padding of the bicep. Shoulder Cap: Dual Core HD Foam Reinforced w/ D3O Sensitive Foam Type of design and/or protective padding of the shoulder cap. Rated 3 out of 5 by Jay1 from Runs smaller than other brands CCM runs smaller than most products. I bought this for my 6 year old who out grew his previous shoulder pads that were a different brand and size small. According to the size charts he should have been in a large. This fit him the same way the small fit. Surprisingly enough this one fits my 2 year old. So we decided to keep it and get him started on the ice. I am unhappy that these did not fit for the purpuse that they were intended.